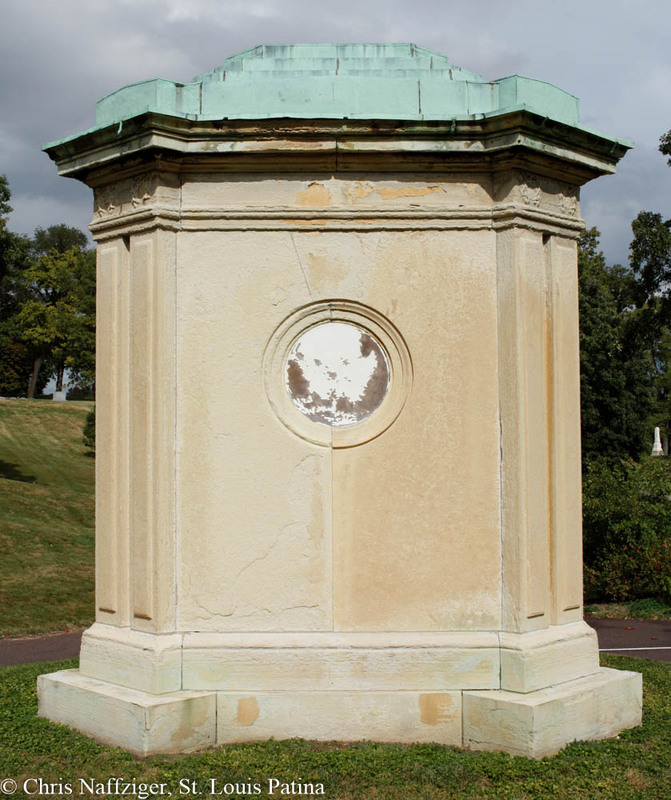 The Dr. David Brock Mausoleum sits in what would have been one of the most prominent locations in Bellefontaine Cemetery when it was originally founded and the front gate was along the eponymous road and fort, now North Broadway. 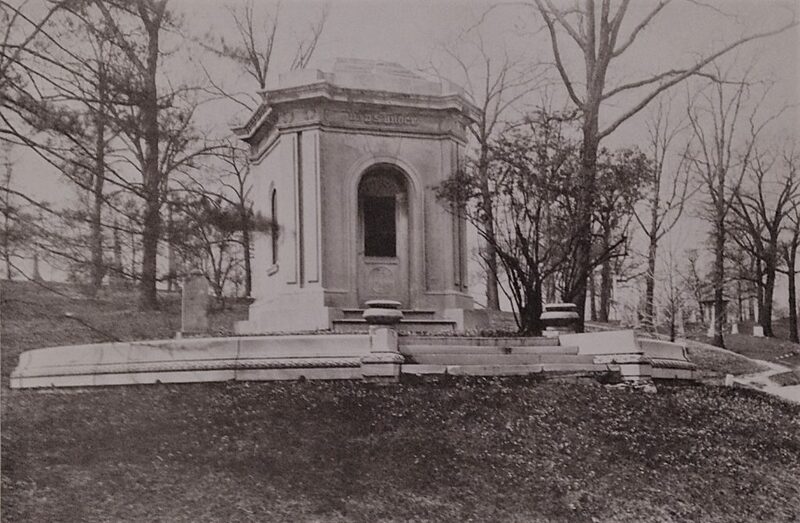 As can be seen in the photograph above, this George I. Barnett-designed mausoleum once had an outer perimeter encircling the front entry, which I suspect was made of the same porous limestone or sandstone as the main building. This is an incredibly harmonious building, and it might be a bit hard to explain, but when I look at this mausoleum, I can tell that Barnett completely understood classical concepts of proportions and design. Just look at the picture above: every measurement is perfectly balanced with each other. 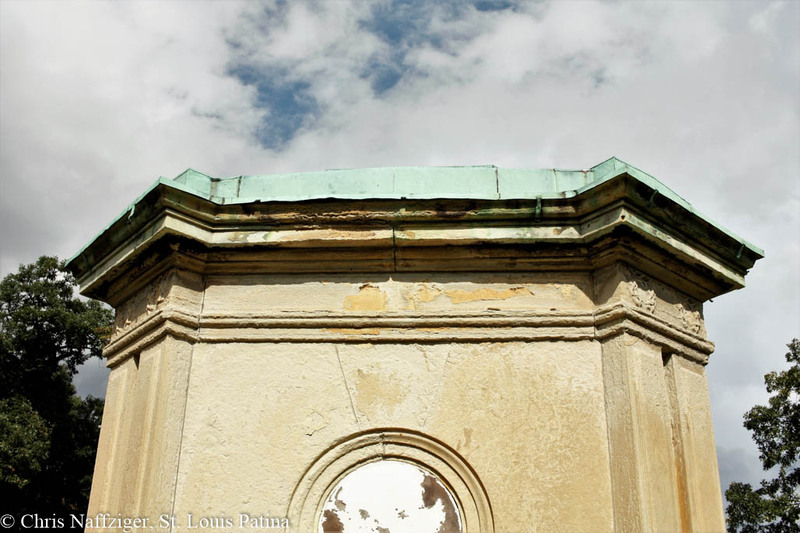 Even the erosion of the soft stone cannot hide the beauty of the mausoleum, which has an interesting mix of interned remains. 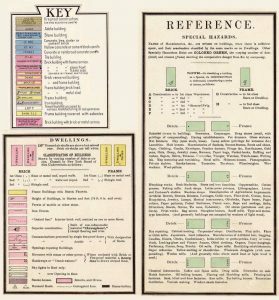 There is the doctor, and then an young daughter, and a couple of other people with different last names. The book from where I found the image claimed it was constructed in 1874. 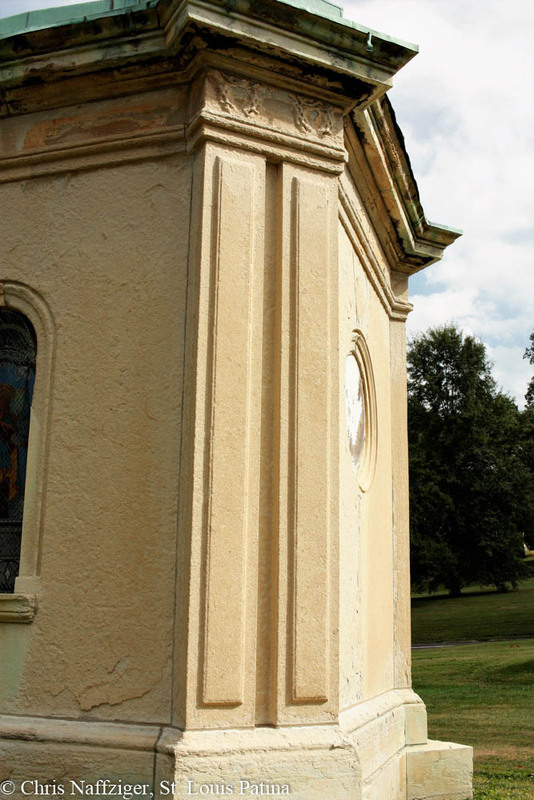 I strongly suspect Dr. Brock was Roman Catholic, as the Archangel Gabriel appears on the right side of the mausoleum in what looks to be either stained or painted glass. It is covered with a protective grate. The other window is covered up with copper, and the back window, which is round, is also covered. I suspect that the round window depicted the dove of the Holy Spirit, and the other window showed the Virgin Mary, which along with the extant Gabriel, would create an Annunciation scene. 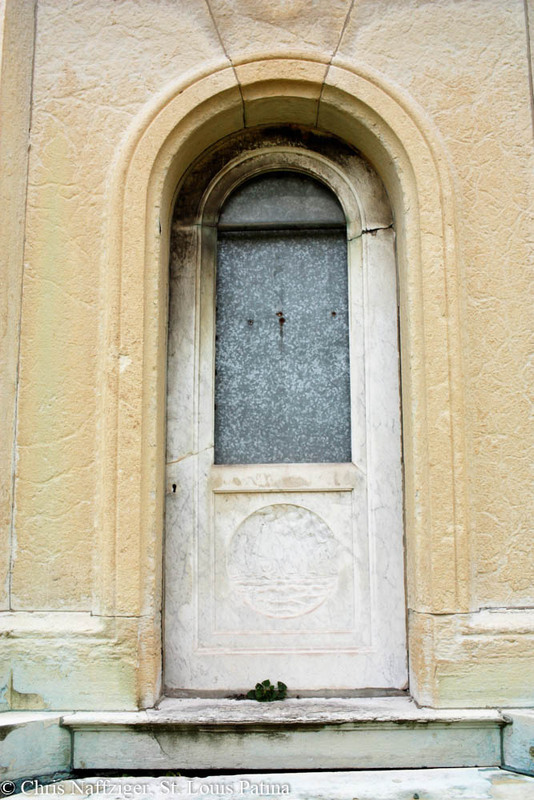 So that brings us to the front door, which like many mausolea in the cemetery, possesses a marble front door. I attempted to enhance the low relief sculpting on the roundel below the window in the door, and we discover more Roman Catholic iconography, the Stella Maris, translated from Latin as the Star of the Sea, which is a symbol of the Virgin Mary. Early Christian theologians struggled to find a cognate of the Hebrew Maryam, and they settled on a false cognate from the Latin word for “sea.” But the iconography stuck, and the Virgin Mary came to symbolize a new, pure mother figure to triumph over the pagan Venus. Venus is the morning star, and now Mary guided sailors on stormy seas. Venus of course is brighter than even Polaris, the North Star, long used for navigation, as well. The Stella Maris, Star of the Sea, thus guides humanity through troubling times. If he was Roman Catholic, it seems curious that he has such a prominent tomb in Bellefontaine, rather than having been buried in Calvary Cemetery. 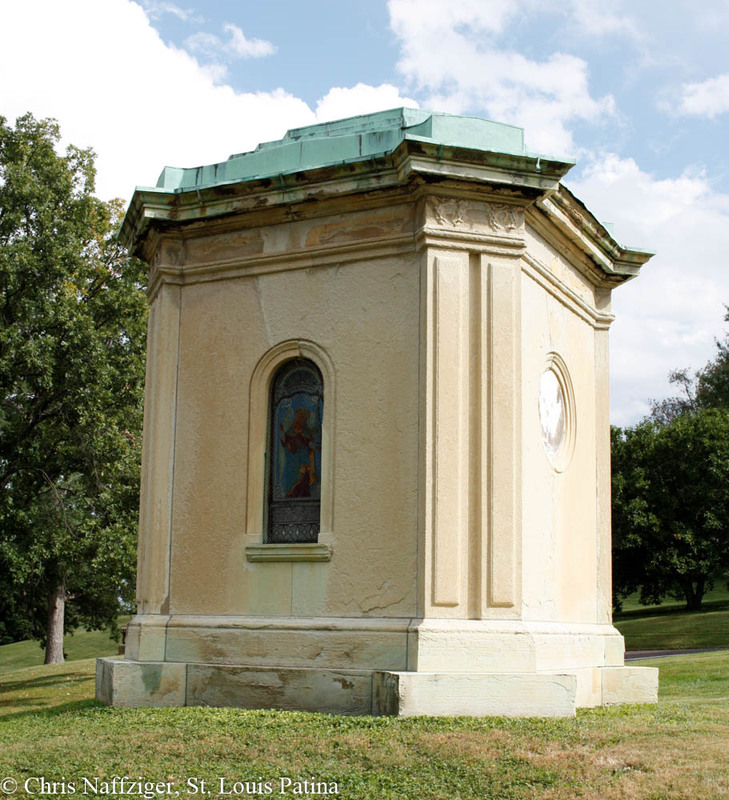 There are notable examples of Catholics buried in Bellefontaine–many of the Griesediecks, for example, are not buried in Calvary. 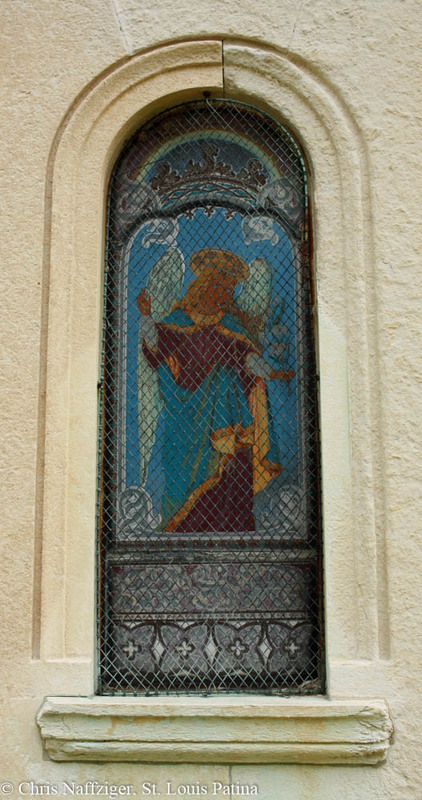 Yes, that appears to be an Annunciation scene portrayal of Gabriel, very similar to our window at St. Francis de Sales, where Henry and Rosa Griesediecks were parishioners and donated several windows. I was hoping you would see this, Bob! 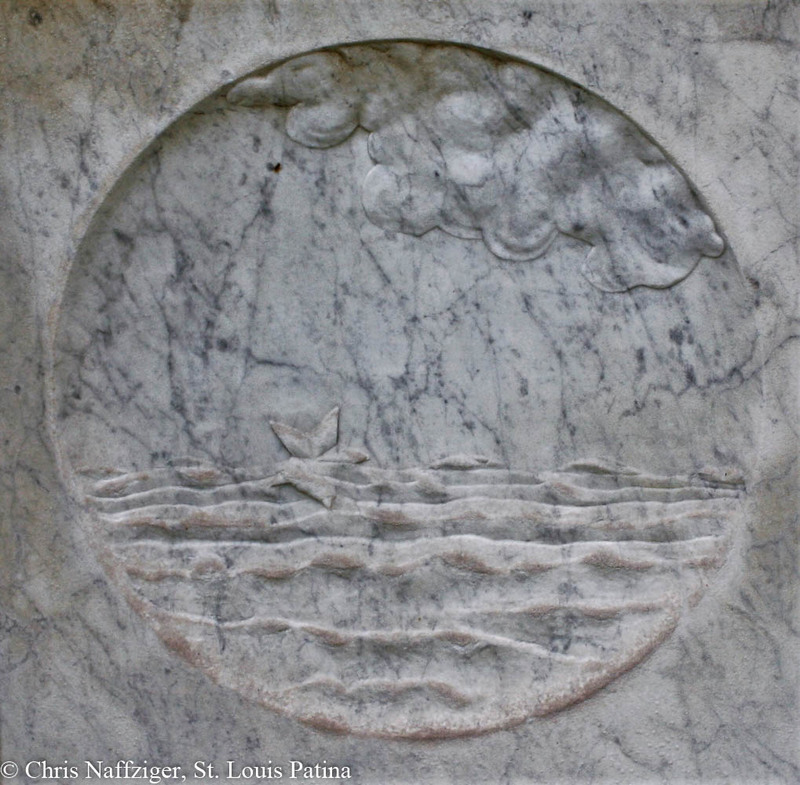 Have you seen the Stella Maris motif before?